This involves fairly simple soil arrangement methods that encourage the water to infiltrate the soil to increase its fertility and limit erosion. 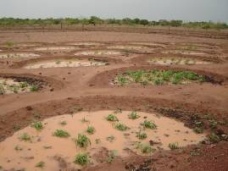 Mainly growers in arid areas where the rainwater does not infiltrate the soil and/or damage the land. 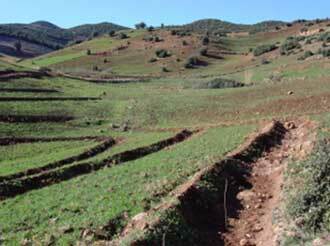 When rainfall causes erosion, the upper layers of the land - the most fertile - are carried away. Preventing this phenomenon is a simple way of increasing the yield of cultivated land considerably. In addition, these techniques encourage the water to infiltrate the soil, which is very beneficial in regions with insufficient rainfall. These are the main methods currently used. Half-moons are semi-circular basins 2 to 6 m in diameter that are dug on gentle slopes (<3%) to retain the water. Earth from cuttings is laid on the downstream edge of these basins. The downstream side of the earth collar thus created can be strengthened with pebbles. The half-moons are laid in staggered rows with four metres between them. Compost or fertiliser is spread to improve soil fertility. Poor soils produce better results when the half-moon system is used. This method is effective for rainfall of less than 600 mm. The effects make themselves felt in the first season. If manure is added, a production of one tonne of sorghum grain per hectare can be expected. This method involves digging holes about 30 cm deep at regular intervals which are then filled with compost or manure. This method is particularly useful in hardened, unproductive degraded soils, as they retain the runoff water and make the land fertile again. By applying this method with the addition of stone barriers (see next paragraph), about 800 kg of grain per hectare can be expected. Stone barriers have the same aim and action principle as the half-moons. It involves slowing down the water runoff to limit erosion and encourage infiltration. This technique is suitable for gentle to medium slopes in a sandy-clay or gravelly soil. Low stone walls about 25 cm high are build perpendicular to the slope. Cereal or forage production can increase by 20% when manure is added. This method is effective for rainfall of less than 800 mm. A terrace is a ditch 70 cm deep with an earth collar that follows the contours of the land. The terraces are about thirty metres apart. The principle is the same as for the stone barriers : the terraces form an obstacle to the water flow and thus limit erosion and encourage infiltration. 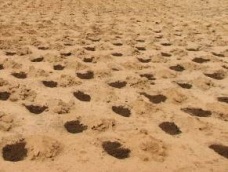 This technique is used on over a million hectares in Tunisia. Digging terraces is however a huge undertaking. A single person needs a full day to dig about ten metres. These projects must therefore be carried out at community or village scale. On www.thewaterchannel.tv, the specific video on this subject (enter "terraces" in the search box) shows a project carried out in forty communes together, where the inhabitants joined forces to create terraces on the cultivated lands. Thus, 300 km of terraces were dug in two years. 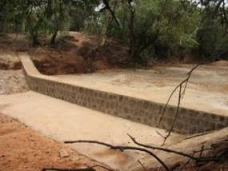 A sand dam is a small dam that is constructed most often in a seasonal or intermittent water course. It has the effect of causing sand to accumulate upstream from the dam. The sand can have as much as 40% water in it depending on the size of the dam, which is serious reserve. The dam is a stone and concrete wall that must be installed where the river bed is rock. - It offers easy access to the water. The water is stored in the sand for long periods depending on the rainfall. All that is needed then is to dig in the sand to locate the water which has been filtered by the sand and is therefore normally fairly clean. - The water retain in the dam infiltrates into the ground, thereby raising the level of water tables. This frequently has a very significant impact on plant growth both upstream and downstream of the dam. Filtering dykes have a fairly similar arrangement to the sand dams. A filtering dyke is an engineered stone structure without concrete built across a strong runoff area in cultivated land. Depending on the site and the intensity of the runoff, it is 0.5 to 2 m high, 30 to 200 m long and 1 to 4 m thick. Deposits accumulate upstream from the dyke as the rain falls, helping to counteract erosion. 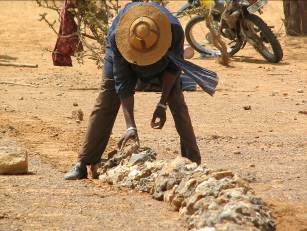 Filtering dykes are less efficient in storing water than sand dams as they let the water through. They are, however, easier to build as no concrete is required. - Improved yield from cultivated land. - Effective measures against land impoverishment. Most these methods are very work- and labour-intensive. - FAO, Food and Agriculture Organisation of the United Nations.